A concise and practical visual guide to normal cell identification for all those dealing with cytology in the dog and cat. 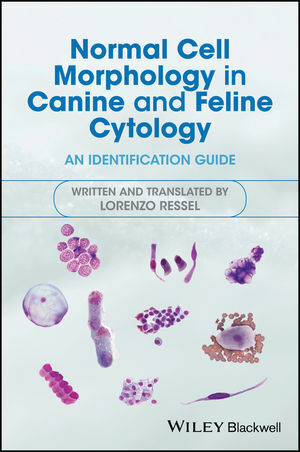 Normal Cell Morphology in Canine and Feline Cytology: An Identification Guide takes a uniquely visual approach to normal cell identification in dogs and cats. Single-page presentations offer vivid snapshots of particular cell types, with high quality microphotographs matched with annotated schematic diagrams and accompanying explanatory text. Providing a vital understanding of what normal cells look like, this text is ideal for all those in small animal veterinary practice examining cytology samples. The book begins with a concise, yet comprehensive introduction to the principles of morphological identification, followed by a description of the distribution of cells and where different cell types can be sampled from in the various tissues and organs. The main part of the book is devoted to describing each cell type and its characteristics. Cytoarchitectures, observed non-cellular material and general pathological changes are also described. Normal Cell Morphology in Canine and Feline Cytology is a must-have text for veterinary students and an indispensable bench manual for small animal veterinary practitioners. Lorenzo Ressel is a Senior Lecturer in Veterinary Pathology at the Institute of Veterinary Science, University of Liverpool, UK and a Fellow of the Higher Education Academy.